Whew! Out with the old, in with the new - that's certainly what we're doing here at Beverlys. Our January Circular is now available. Take a look at it here. Give your room a fresh look - and get your scrapbooking supplies organized. 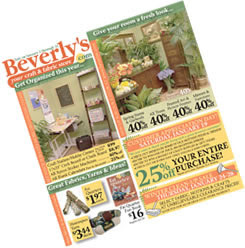 Beverlys has great deals to help you make that happen. This month's TRY IT! Station Tool is the Knifty Knitter. Come into you local Beverlys and see how easy it is to knit with these fun looms. Also, check out this month's internet coupon here. Here's to a "crafty" 2008!